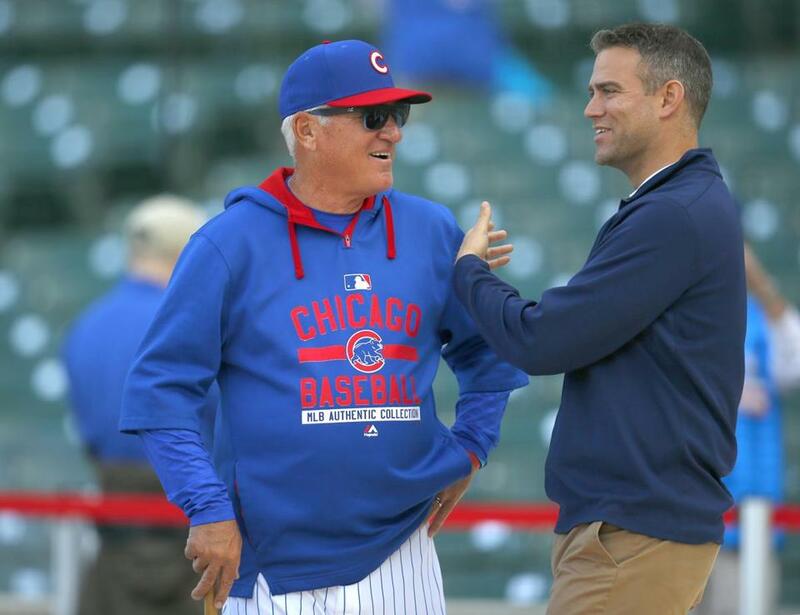 Cubs president Theo Epstein (right) accelerated the team’s rebuilding process by bringing in manager Joe Maddon before last season. Now the expectations in Chicago are sky high. Let’s say his Chicago Cubs win the World Series for the first time since 1908. That would make Theo Epstein a Hall of Fame executive. To win three championships with two of the most storied franchises while ending epic title droughts would give Epstein, 42, a unique place in baseball history. The Cubs lost in the National League Championship Series last season after winning 97 games, and Epstein acknowledged that his youngsters arrived a year ahead of schedule. Epstein then brought in veteran leaders for the pitching staff (John Lackey) and lineup (Ben Zobrist). In addition, Epstein signed Gold Glove right fielder Jason Heyward (eight years, $184 million), but he plans on using him in center so he can keep young slugger Jorge Soler in right and Kyle Schwarber in left. With NL Cy Young winner Jake Arrieta heading a rotation that includes Jon Lester, Lackey, Kyle Hendricks, Jason Hammel, and Adam Warren, it looks like Epstein could very well soon bring a championship to Chicago. Epstein, who was in Boston on Thursday for his annual “Foundation To Be Named Later” dinner at the Hotel Commonwealth, has used advanced stats, great amateur scouting and drafting, and strong signings and trades (the Arrieta deal with the Orioles was nothing short of brilliant) to create a tremendous rebuilding story. Epstein joined the Cubs after the 2011 season and inherited some seemingly immovable contracts, such as those belonging to Alfonso Soriano and Aramis Ramirez. He traded for Anthony Rizzo and began to construct the lineup around his young stars. Epstein also had to find the right time to accelerate the process. He did that last offseason by bringing on manager Joe Maddon and outbidding the Red Sox and Giants for Lester (six-year, $155 million deal). Epstein slowly integrated Soler, NL Rookie of the Year Kris Bryant (remember the controversy of holding Bryant back to delay his service time? ), Schwarber, Addison Russell (acquired from Oakland at the 2014 trade deadline for Jeff Samardzija and Hammel), and Javier Baez into the lineup. And everything he did seemed to come up aces. Epstein closely studied what the Royals have done, the patience they exercised with some of their young core players. “We spent a lot of time talking about KC as we planned our rebuild,” Epstein acknowledged. “Basically it was an eight-year process [for them] to get to the World Series. They did a masterful job. Because he works in a large market, Epstein wasn’t afforded the same rebuilding pace as the Royals. But what he learned from KC’s situation is not to panic when young players have down years. It almost seems that Epstein is entering 2016 with caution. He knows his kids performed well beyond expectations last year. 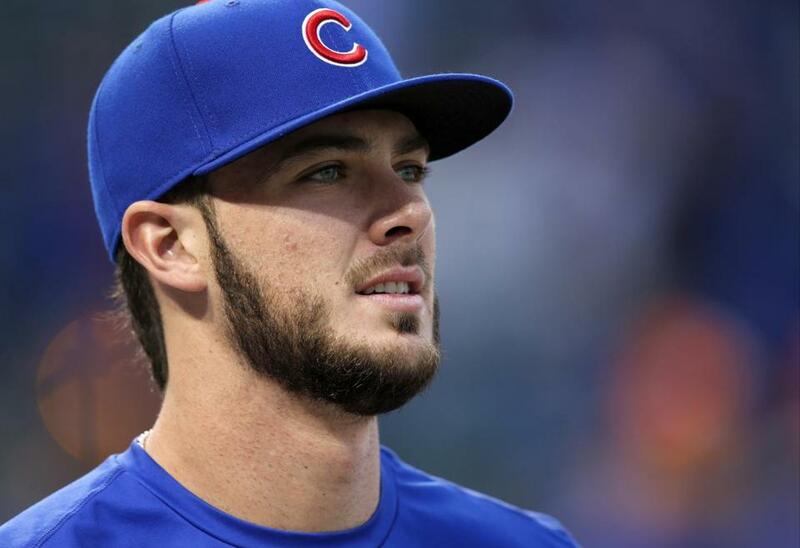 Third baseman Kris Bryant was the NL rookie of the year last season. “We just had a little magic last year. I can’t fully explain it,” Epstein said. “I think there’s strength in numbers. Players rose to the moment. When Kris Bryant started to get tired and the league caught up to him a little bit, Kyle Schwarber came up and took some of the pressure off, hitting some big homers, and then Kris had time to adjust. And in the postseason, Jorge Soler got hot and reached base nine straight times and hit big home runs. Asked whether the Cubs had entered the final phase of the rebuild, Epstein answered no. “I think you can get yourself in trouble if you think you’re taking that last step or two and building the perfect team. Often times it leaves you in a worse spot because it leaves you inflexible to react during the season and address weaknesses that crop up. We have some issues that we’re curious to see as guys respond to new roles,” he said. Epstein thinks the Cubs have good bullpen depth, but feels they’re thin in starting pitching depth in the minors. He says he’s happy that he didn’t give up much from his farm system this offseason. He traded away former All-Star infielder Starlin Castro — to the Yankees for a valuable swingman in Warren — and replaced him with Zobrist. It’s hard to improve on 97 wins, but the Cubs are more interested in going deeper into the postseason, which is why Epstein brought in the proven vets. If Epstein can bring the Cubs a world championship, the city of Chicago will never be the same. Giants GM Bobby Evans, who grew up in Framingham and interned with the Red Sox, thinks his team is just about done making offseason moves. Evans, appearing at Theo Epstein’s charity event, said he has been monitoring free agent Tim Lincecum, a longtime fan favorite in San Francisco, but he doesn’t anticipate a Lincecum return with the Giants’ full rotation of Madison Bumgarner, Jeff Samardzija, Johnny Cueto, Jake Peavy, and Matt Cain. Lincecum could be considered for a bullpen role as he recovers from hip surgery. 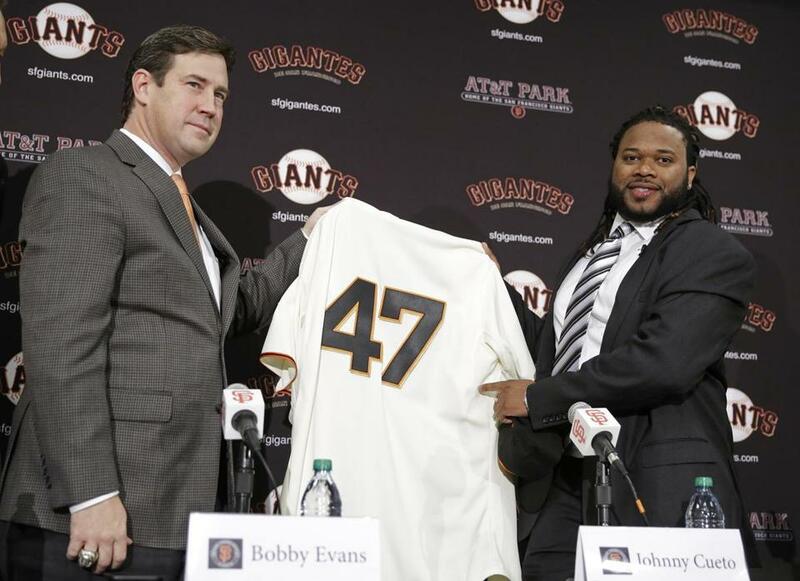 Bobby Evans (left) signed Johnny Cueto to a $130 million, six-year contract. Right now it looks like Chris Heston, 27, who made 31 starts for the Giants last season and produced a 12-11 record with a 3.95 ERA, will work out of the bullpen. Heston could easily enter the rotation if Peavy or Cain fail. Evans battled with Pablo Sandoval over the third baseman’s weight issues during his time in San Francisco, but the GM was happy to hear about Sandoval’s weight loss this offseason and expects a bounce-back year from him. The Giants, however, have not regretted losing Sandoval in free agency as it created an opening for Matt Duffy, who finished second in Rookie of the Year voting after hitting .295 with 12 home runs, 77 RBIs, and a .762 OPS. The Giants’ bullpen is stacked with closer Santiago Casilla, setup man Sergio Romo, lefthander Javier Lopez, and middle men George Kontos and Hunter Strickland. Evans could add a reliever on a minor league deal (Lincecum?). The Giants must replace the very steady Jeremy Affeldt, who gave the team seven years before retiring after last season. The Giants will also give long looks to Josh Osich, Sam Coonrod, Michael Broadway, and Cory Gearrin. The team’s top pitching prospect, Tyler Beede of Auburn, could eventually get a look, perhaps out of the bullpen at first. 1. Dave Dombrowski is intrigued by the number of good free agents available. He’s willing to bring in a player or two on a minor league contract. Teams are in that phase now where they can sign quality players to minor league deals with an invitation to spring training. But agents, of course, advise their clients to hold out for major league deals as long as possible. Lots of bargains potentially out there. 2. Glad to hear that some NL owners, according to Red Sox chairman Tom Werner, are warming to the idea of using a DH. With pitchers called upon to bat less as they progress in their amateur and minor league careers, it makes no sense to have them bat in the majors and expose themselves to injury. Pitchers cost too much. 3. Can’t we just leave the strike zone alone? 4. Theo Epstein said one of the first major things he did when he took over the Red Sox was copy the Indians’ development philosophy. It was interesting to hear, but if the philosophy was so good, why haven’t the Indians won? 5. The Orioles are one consistent veteran pitcher away from being a very good team. 6. Until I see it work, I still have reservations about the Red Sox using Koji Uehara (coming off a wrist injury) as a setup man and Junichi Tazawa (overworked) as a dependable seventh-inning guy. 7. Saddened to hear of the passing of former Providence mayor Buddy Cianci, a big fan of this column. 8. If the NFL’s Raiders end up moving to Las Vegas, does that increase the chances of Major League Baseball moving there? 9. Toronto’s Triple A affiliate in Buffalo will be a Red Sox reunion — manager Gary Allenson, hitting coach Richie Hebner, and pitching coach Bob Stanley. 1. Jonathan Lucroy, C, Brewers — A few baseball folks feel something’s brewing with Lucroy, as teams such as Houston and Washington may be interested in adding a top catcher. Lucroy does have a limited no-trade clause, but as we’ve learned, no-trade provisions are negotiable. Adding Lucroy would allow the Astros to play Jason Castro some at first base. 2. Tyler Clippard, RHP, free agent — Clippard remains one of the top relievers on the market. The Mets may still bring back Clippard, who suffered from what some thought was shoulder fatigue at the end of the season. Clippard struggled with command late in the year, but when right, his signature changeup is a nice out-pitch. 3. Ian Desmond, INF, free agent — Desmond is one of the handful of remaining free agents who are attached to draft-pick compensation. One NL scout said he’d recommend Desmond, 30, moving to third base. “I think he would be excellent there,” said the scout. “He’s a shortstop who probably doesn’t have the great range, but he’d be very good at third. He’s a great kid in the clubhouse who works hard. At some point, there has got to be a team, maybe one who has a pick at the end of the first round, who’d give that up for a guy like this.” Makes sense for the Angels, White Sox, Indians, and Rays. Desmond grew up in Sarasota, Fla.
5. Desmond Jennings, OF, Rays — The Rays traded lefty reliever Jake McGee to Colorado in a four-player swap that landed outfielder Corey Dickerson. That gives the Rays an outfield of Jennings, Dickerson, Steven Souza Jr., and Kevin Kiermaier, not to mention the recently signed Steve Pearce. Could Jennings, who was limited to 28 games last season because of a knee injury, be the odd man out? He may be the most talented player in the Rays’ outfield, but he’s 29 and owed $3.3 million in 2016. The Rays may not be done dealing just yet. 6. Kyle Lohse, RHP, free agent — Lohse had a horrible season in Milwaukee (5-13, 5.85), but teams looking for a veteran to add to the back of their rotation will consider him in hopes of a bounce-back season. The Marlins, for one, are exploring that possibility. 7. Doug Fister, RHP, Astros — A few teams had concerns about the medicals on Fister, according to one NL team official. No team was willing to meet Fister’s demand of two years and $22 million, but at one year and $7 million, the Astros thought it was a good gamble for a guy who really knows how to pitch. Some teams thought they could get him on a minor league deal. 8. Jacoby Ellsbury, CF, Yankees — Ellsbury is said to be completely healthy and ready to go after assorted injuries played havoc with his 2015 season. The Yankees are expecting a better center fielder, a better base stealer, and a better overall hitter (with power). The Yankees still believe Ellsbury, when healthy, is their most talented player. From the Bill Chuck files — “Last season, David Price against lefties threw 475 fastballs and batters hit .261 against it. His second favorite pitch was the cutter, Price threw 124 and lefties hit .343 off it.” Also, “In 2015, Cody Allen led the majors with seven saves in which he recorded at least four outs. In 1965, Stu Miller and Bob Lee led the majors with 19 saves in which they recorded at least four outs.” . . . Happy 67th birthday to Fred Kendall and Jim Willoughby.